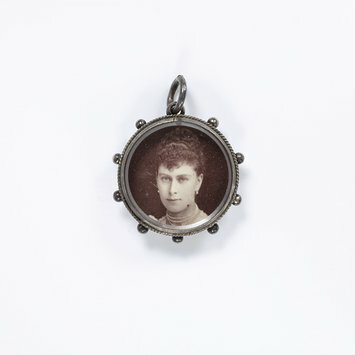 A locket can be defined as a receptacle in which a photograph, a lock of hair, a portrait or other sentimental or religious item or memento can be contained. 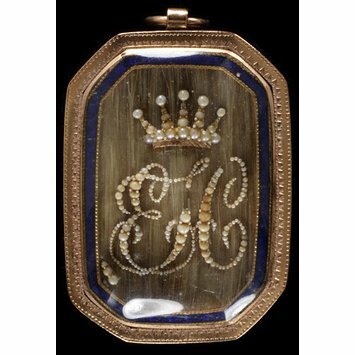 Lockets can be closed, or open with the memento either exposed or protected under glass, plastic (in more recent times) or rock crystal. Usually worn as pendants, lockets can also come in brooch, ring or possibly bracelet form. 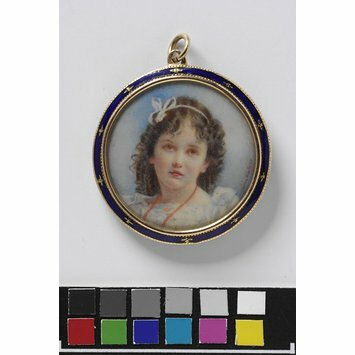 Lockets were extremely popular in the Georgian and Victorian era, appealing to the romantic, loving and extremely sentimental nature of the people of those eras. 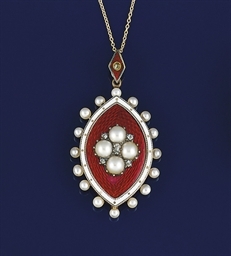 Lockets continued to be popular right up until the late 1950s. Although still worn today, they are now somewhat less ubiquitous. Here are some different types of lockets below. Although hand-painted miniatures were more popular before the first daguerrotype photographs were patented in 1839, they did continue to be popular into the early part of the 20th century. The first daguerreotype photograph was patented in 1837. 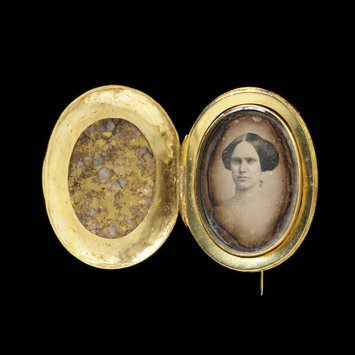 Wearing photographs of loved ones in lockets soon became very popular and continued until the present era. Hair belonging to loved ones, alive or deceased, could be incorporated in jewelry in a variety of ways. 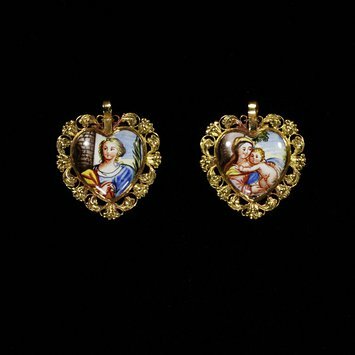 It could be worn inside the locket, or in a special compartment in the back, or woven or braided to create the jewelry itself, or used in tiny paintings, often on ivory. 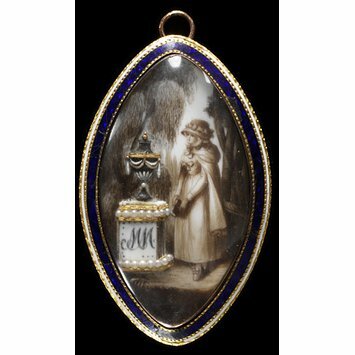 There are many surviving examples of memorial lockets for the dead, particularly from England. Many of them have names and the dates of death. They first emerged around 1760. The lockets of that era were often bought ready made and then customized for the individual. Neo-classical themes were common, in particular cherubs, urns, plinths and obelisks. Angels and weeping willows were also common motifs. Hair from the deceased person was often incorporated. Later on, simpler memorial designs, such as the winged heart below, became popular. 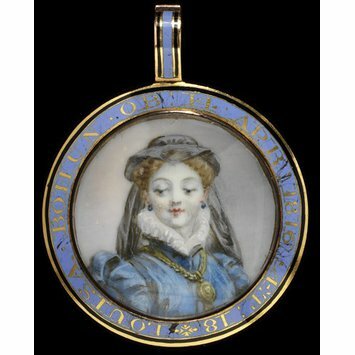 Lockets were often worn as brooches, either open or closed. Lover’s Eyes Jewelry were popular in the Georgian era. 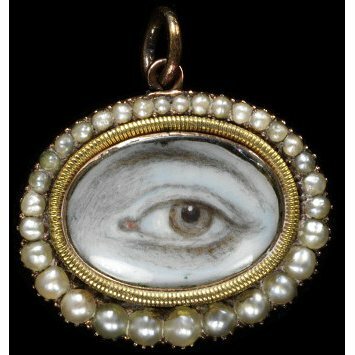 These were a truly charming and very compelling form of jewelry in which a miniature portrait of a loved one’s eye was worn in a pendant or as a brooch. Genuine Lover’s Eye jewelery is very much a collector’s item today. 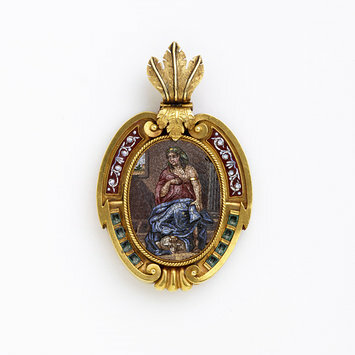 Religious motifs were popular in lockets. Navette shaped jewelry is associated with the Georgian era, but has continued to be popular until today. 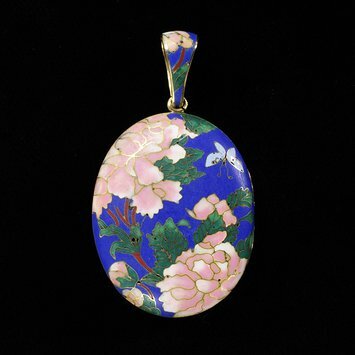 There are many examples of beautifully enameled lockets. 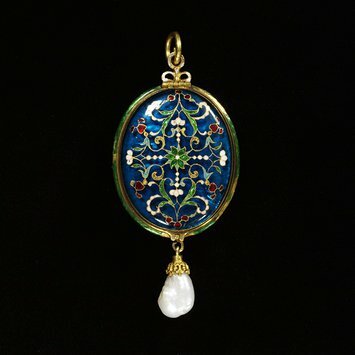 Classical Motifs and Micro-mosaic were popular in lockets. Much of it was brought back from Italy during the ‘Grand Tour’ era. 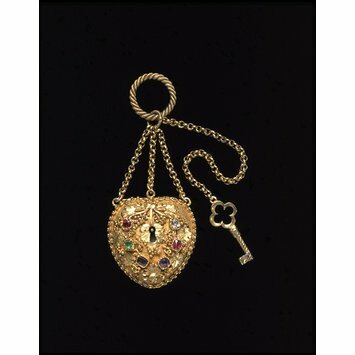 Lockets in the form of padlocks were popular since at least 1840 and probably before. 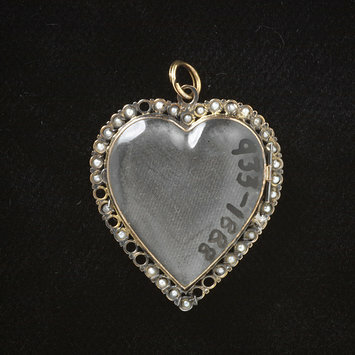 Heart-shaped lockets have been especially popular for a very long time. 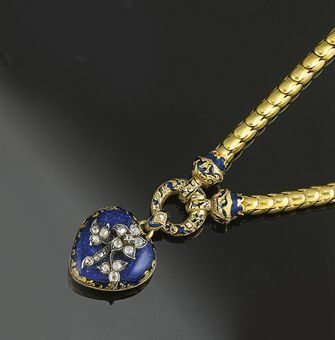 Earlier heart-shaped jewelry had a tendency to have longer hearts with less of a pronounced indentation in the top. 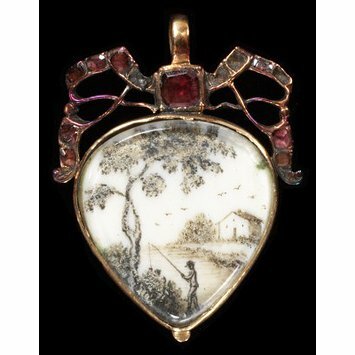 C. 1850, Heart Shaped Locket and Chain.